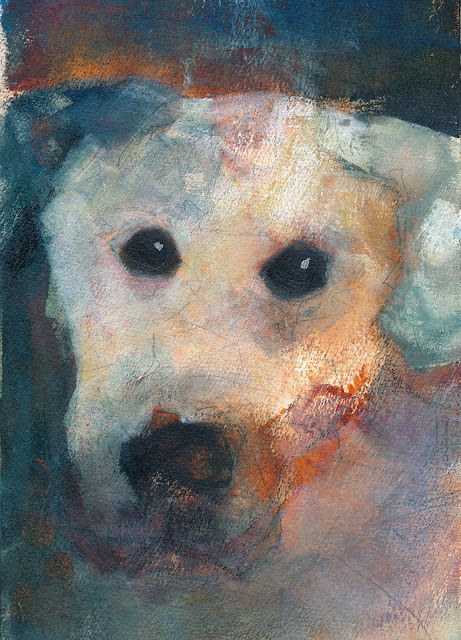 Such beautiful eyes!And great light in this painting as if the dog was partly in sunlight. 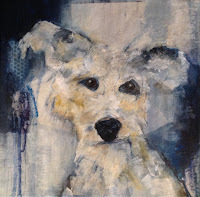 Thank you Martine - I am finding with the dogs that the eyes can make it or break it! I affirm your stopping point! Such softnesses, and loose definition, and gentle but unmistakable suggestion. wow. The red iron oxide adds punch, contrast, and, on this pooch's face, the engaging question of not knowing quite what I'm seeing (did she get into the Spaghettio's while you were pouring dry dog food?!). The direct gaze of those eyes in combination with the faint but visible sketch marks speak to me of the vast interior life and soul of this creature. Thank you Dotty! Do they still make Spaghettio's ?! This is pretty much the gaze our two use on us when meal time arrives - and they don't like to be kept waiting. Red iron oxide is a strong colour but it can add such richness to a painting - mixing it with phthalo blue and phthalo green makes the most incredible rich dark - you will never use black out of a tube again! Love the loose unfinished look. Fresh! Love the mix of oranges and blues, and those eyes! Hi Carol - so glad you like her - I need to do a hundred more! !